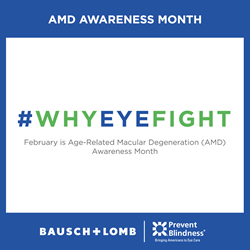 “We value our continued collaboration with Bausch + Lomb and the #WhyEyeFight program, that helps those living with AMD, and their caregivers, learn about this disease and the best ways to help prevent significant vision loss from it,” said Hugh R. Parry, president and CEO of Prevent Blindness. Bausch + Lomb, a leading global eye health company, today announced the launch of a public service announcement and docu-series, designed to raise awareness of Age-related Macular Degeneration (AMD), the leading cause of vision loss in adults aged 50 and older. The series includes deeply powerful stories of people living with AMD, while encouraging others to understand the risk factors for AMD and how to help reduce the risk of progression of the disease. Though there is no cure for AMD, there are steps that patients with AMD can take that can help to reduce the risk of progression, such as maintaining a healthy diet and taking PreserVision® AREDS 2 Formula eye vitamins—which contain the exact nutrient formula recommended by the National Eye Institute for people with moderate to advanced AMD . Patients should talk to their eye doctor to see if an AREDS 2 formula vitamin is right for them. The public can help raise awareness by adding the #WhyEyeFight custom frame to their Facebook profile picture, or by sharing social posts with the hashtag, #WhyEyeFight. Links to the Bausch + Lomb AMD Facebook posts and instructions on how to add the Facebook profile picture frame are available at http://www.WhyEyeFight.com. For more information on AMD or the #WhyEyeFight campaign, visit http://www.WhyEyeFight.com or http://www.preventblindness.org/amd. Follow the conversation on Twitter and Facebook using the hashtag #WhyEyeFight. Founded in 1908, Prevent Blindness is the nation's leading volunteer eye health and safety organization dedicated to fighting blindness and saving sight. Focused on promoting a continuum of vision care, Prevent Blindness touches the lives of millions of people each year through public and professional education, advocacy, certified vision screening and training, community and patient service programs and research. These services are made possible through the generous support of the American public. Together with a network of affiliates, Prevent Blindness is committed to eliminating preventable blindness in America. For more information, or to make a contribution to the sight-saving fund, call (800) 331-2020. Or, visit us on the Web at http://www.preventblindness.org or facebook.com/preventblindness. About PreserVision® PreserVision®, developed by Bausch + Lomb, is the #1 doctor-recommended eye vitamin brand. PreserVision® AREDS 2 Formula eye vitamins are based on the 2013 AREDS2 study conducted by the National Eye Institute, a division of the National Institutes of Health. About Bausch + Lomb Bausch + Lomb, a Valeant Pharmaceuticals International, Inc. company, is a leading global eye health organization that is solely focused on protecting, enhancing and restoring people’s eyesight. Our core businesses include over-the-counter supplements, eye care products, ophthalmic pharmaceuticals, contact lenses, lens care products, ophthalmic surgical devices and instruments. Bausch + Lomb develops, manufactures and markets one of the most comprehensive product portfolios in the industry, which is available in more than 100 countries.